One of the great challenges in teaching STEM subjects is the degree to which the curriculum will be salient to today’s needs. TurboCAD’s STEM Solution series combines products that are used worldwide to solve real problems every day with easy to follow step-by-step training guides and tutorials. Students get to use the products they will use later on professionally. 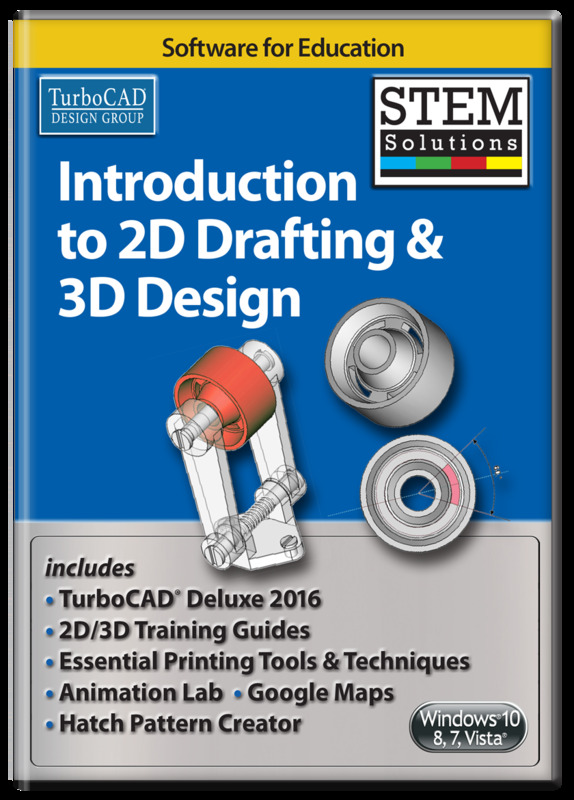 The STEM Solution series addresses not only theory but real life applications with modules for Introduction to 2D Drafting and 3D Design, Advanced Architectural 2D Drafting and 3D Design, Mechanical Engineering and Design Validation, Woodworking and Design, and Home and Landscape Design and Construction. 3 plug-ins to animate designs, insert geo-referenced maps, and quickly create repeating patterns. 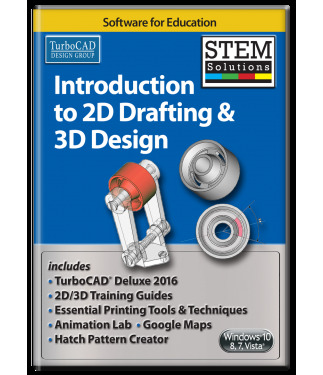 TurboCAD Deluxe 2016 both reads and writes STL files, the standard in 3D Printing world. TurboCAD Deluxe 3D printing features include surface simplification controls and a 3D Print button for 3D Systems printers. This product is in stock, but you must qualify to purchase. Call 800-833-8082 x8097 or email edusales@imsidesign.com today! The #1 best selling CAD brand in retail! TurboCAD Deluxe 2016 delivers precision 2D drafting, 3D modeling, and photo-realistic rendering in an easy to use customizable interface with incredible file support. Order now and see what makes TurboCAD Deluxe 2016 the best CAD package for everyone. Complete Set of 2D/3D Drafting, Design, and Modeling Tools - TurboCAD employs a large selection of line, arc, curve, spline tools, and other expected tools, so that no matter the situation you’ve got access to the right tool for the job. When used with TurboCAD snaps, modification tools, and drawing aids you will be able to quickly draft and document your designs. Context-Sensitive Help - Right-click to instantly access recently used tools, recently entered values, and a quick way to change or reset reference points. If a TurboCAD tool is active, the context menu provides a contextual toolbar as well, with additional similar tools and functions. Flexible User Interface - Turn on and off only the tools you want to see as you work in a familiar, windows-like, customizable interface. Display TurboCAD’s comprehensive set of 2D/3D design tools with full explanations in the beginner mode. Switch to intermediate or expert mode to gain screen space as you become more familiar with the program. Page Set Up Wizard - Breeze through questions designed to help you define your drawing’s size and orientation, units of measurement, printing scale and viewpoints. Advanced Handle-Based Editing - Save time and draw more accurately, more quickly. 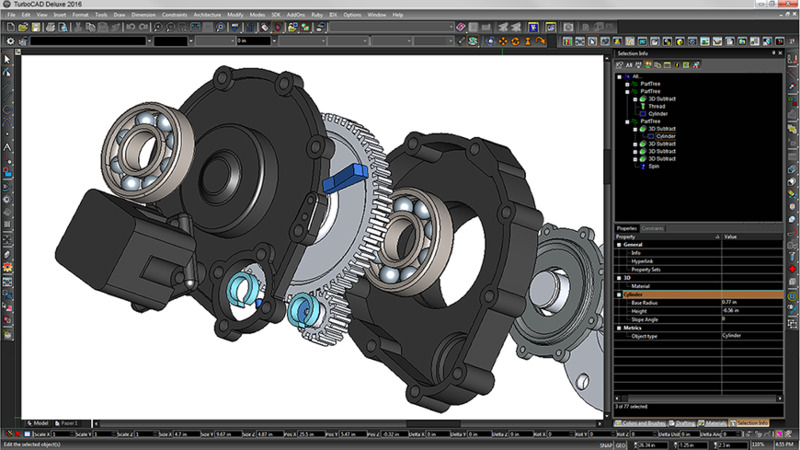 TurboCAD provides handles for scaling, but also for rotating, moving and aligning objects. Plus, the totally flexible design of the Conceptual Selector allows users to customize any visual and editing parameters available in the application (eg. Move, scale, or rotate). Snaps & Geometric Alignment Aids - Draw lines quickly and let snap tools automatically align them with the closest center point, end point, or dozens of points you choose. Geometric alignment aids improve snap indicators. Window or Crossing Selection - Users can select objects with a mouse by using the Window or Crossing methods similar to AutoCAD®. Drag the mouse from left to right to invoke Window mode and select only objects that are entirely within the blue window. Drag the mouse from right to left to invoke Crossing mode and select only objects that touch the green Crossing window. 2D & 3D Text Editing -Create and edit text without leaving your drawing. Plus, choose from thousands of colors for text and background. Floating and Shaped Viewports - Create viewports of Model space in multiple Paper spaces. Edit your viewports by changing their shape or the layers that they display, with the ability to turn on/off layers per viewport. You can even render within a viewport. Optimized for 3D Printing - TurboCAD Deluxe both reads and writes STL files, the standard in 3D Printing world. TurboCAD Deluxe 3D printing features include surface simplification controls and a 3D Print button for 3D Systems printers. Multiple Drawings/Multiple Paper Space - Build multiple drawings, each with multiple paper spaces, with independent settings (grid units, etc. ); then use tabs to quickly switch between paper spaces. Convert to Arcs Polyline - Convert a Bezier or Spline curve into a polyline composed entirely of circular arcs, or entirely of circular arcs and linear segments. Stellated Polygon - Create star-shaped polygon objects in two clicks! Adjust properties for a variety of starred shapes. Table Objects - Create a table on the fly, or import a table from DWG/DXF files. Fill Schedule Wizard - Create and fill the schedule table with drawing information. House Wizard - This big, time-saving tool creates a preliminary room-by-room design of a home, complete with closets, doors, garage and even decks! Intelligent Walls - Self-healing walls automatically join and intersect as you design in 2D or 3D. View wall dimensions with a single-click. Automatic Wall Openings - “Slide” doors, windows, arches or any shape to create “openings” in walls with linked 2D and 3D views. Even set vertical alignment properties. Dimensions display as doors and windows are inserted, showing the distance to and from the wall ends for easier, more precise placement. Plus, corresponding offset fields display in the Inspector Bar. Parametric Doors & Windows - Window and Door dimensions can be scaled to meet your design needs. Further customize with materials and colors. Hatch Patterns and Fills - Choose from over 70 hatch patterns (including colors) to visually identify various components of your drawing. Bitmaps, like your company logo, or gradient fills may also be used with transparency. Fractional Dimensions - Display fractions in stacked, diagonal, or in-line layout to accommodate your personal preferences. Point Marker Tool - Automatically number objects such as rooms, doors or windows. Great for creating legends, call outs, or simply mapping points and adding notes to your drawings. 2D & 3D Boolean operations - Use two existing objects and combined, subtracted, intersected, or sliced to create a new object. Select multiple entities for addition or subtraction. Revolve - Move a 2D object around a revolution axis to create a 3D object. Extrude - Pull complex 3D models from simple 2D shapes. Sweeps - Extrude shapes along a path, perfect for drafting irregular objects. Chain Polyline - Chain Polyline allows for faster design by allowing you to connect intersecting objects or portions of objects into a single polyline which can be then extruded, revolved or swept. 3D Slice - TurboCAD makes it easy to slice, or divide, one or more 3D objects into new objects, by specifying the slicing plane. The 3D slice tool offers the ability to slice by line, by plane, by workplane, by surface, and by facet. Color Transparency - Screen back the color of an object in the foreground to display or emphasize hidden details in the background. Slot Tools - Three new slot tools for inventors, woodworking and furniture design include slot, circular slot, and circular slot by center and radius. GPU Accelerated Drawing & Rendering Engine - TurboCAD Deluxe uses the Redway3d Redsdk drawing and rendering engine to speed design work and create stunning presentations. This drawing engine utilizes the power of supported on-board GPU or graphics boards for faster panning, zooming, and orbiting. It also provides photorealistic and artistic rendering capabilities for presenting your designs. Lights and Luminances - Redsdk acts as both a real-time and a photo-realistic rendering engine. Therefore, it contains many lights and luminances used for different needs. Real-time draft mode rendering typically uses ‘centric lights’ point based light sources because the lighting cast is easy to calculate on graphics hardware. In the real world, these lights don't exist at all. All real lights (luminances) have an emitting geometry such as a lamp filament or a neon tube. These are called ‘physical’ lights, or luminances. Physical lights produce smoother lighting than the one produced by centric lights. Ambient light – An ambient light adds a constant omni-directional light source affecting everything equally. Point light – The point light produces lighting in all directions radiating from a point. Spot light – The spot light produces lighting radiating in a cone from the cone apex. Directional light – A Directional light shines everywhere along a single direction continuing infinitely in that direction and at the same intensity. Beam light – A Beam light shines along a single direction in a beam of a specified radius. 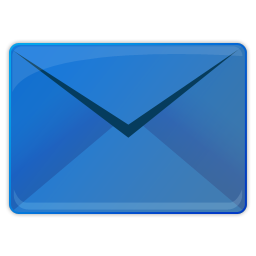 Area light – Area light sources are light that emit light from a specified rectangle. Materials Library - Choose from or create your own realistic material patterns, transparency, reflectance, and texture types and settings as well as multiple wrapping options to make designs look like they will in real life. Design Director - Organize, access, and explore design alternatives easily in the Design Director Palette. Create layer templates, light templates, camera templates and powerful layers for use on different designs. Layer filters, that are .dwg compatible, help you manage large, complex drawings with ease. TurboCAD Deluxe layers are AutoCAD compatible, including a layers dialog based upon ‘Design Center’. Colors, Brushes, Bitmap and Gradient Fills, and Transparency - TurboCAD allows for hatch patterns and gradients to be layered with transparency. Custom bitmaps, such as your company logo, may be used as well. This empowers you to much more clearly and precisely communicate construction or assembly details. Industry Standard Files Supported - TurboCAD Deluxe nearly 30 industry-standard formats making it easy to share your work or as a companion product. Improved AutoCAD DWG/DXF Read/Write filters - TurboCAD has always offered excellent compatibility with native AutoCAD and AutoCAD LT files. 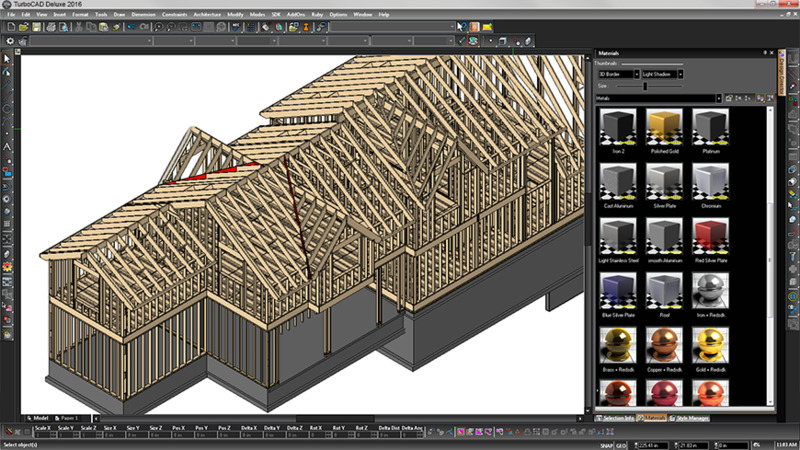 Filter enhancements offers improved file sharing with AutoCAD 2016. Xref Manager - Manage external references (Xrefs) like a parts catalog in your TurboCAD drawing. Xrefs can also be exported with DWG or DXF drawings for greater AutoCAD® file compatibility. SketchUp SKP 2015 Read/Write Filters - TurboCAD 2015 offers both Read and Write file filters based on the latest SketchUp 2015 APIs. Import detailed information from your SketchUp model into TurboCAD. Supplemental rendering, lighting and materials information is also imported. You can also convert your TurboCAD models into native SketchUp (.SKP) files for seamless import into Google SketchUp. 3D Printer Support - Export 3D models to STL file format for rapid prototyping with 3D printers. PDF Publishing - Save your drawing as PDF documents for easy sharing. Plus, export paper spaces, customize your fonts and define your paper widths and heights. 2D/3D Training Guides for TurboCAD Deluxe includes 15 self-paced work sessions. A full instruction video on how to complete each task is included with each work session, along with a practical task drawing to produce a similar drawing with the tools learned. As you work along with each video, pause, rewind or fast-forward while you draw. Lessons can be repeated as often as you like. A highly detailed and illustrated TurboCAD Deluxe 2D Tools section provides instruction in all the tools needed to produce 2D technical and architectural drawings. 8 work sessions provide all the knowledge needed to produce 3D Designs. Subjects such as the 3D Design Environment, Creating & Extruding Profiles, 3D Objects, Parametric Updates, Boolean Facet, Assembly and 3D Scene tools using basic to advanced 3D features. Each session contains a fully detailed Task Drawing & Worksheet with a full Activity Overview outline at the start of each session. Each Work session contains a fully finished example of the Task Drawing and also provides a sample from which to start the Session. 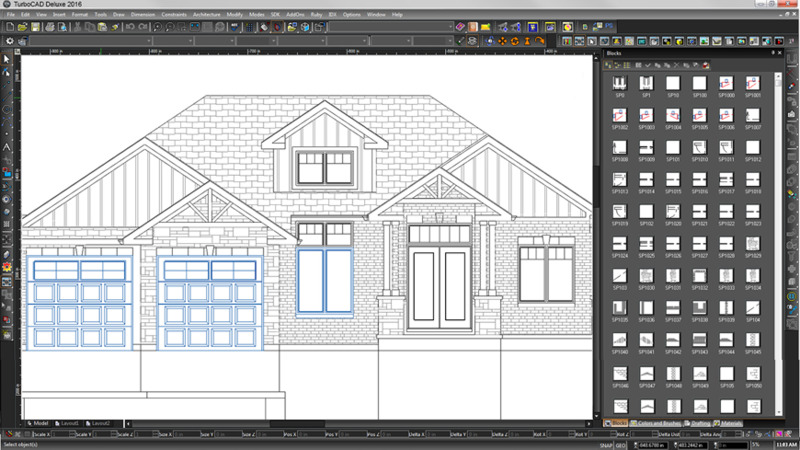 All drawings can be opened in TurboCAD Deluxe, or viewed and downloaded in pdf format. Each Session is supplied with a full summary of the key features of the tasks at the end of each Work session. This training product teaches printing techniques in TurboCAD 2016, including how to create professional PDF files. It is an audio-video training product developed by TurboCAD expert Robert Berry and it demonstrates all of the most important printing functions within TurboCAD 2016. Directions on using a 3D printer is not included. Drawing Management - AnimationLab provides capabilities for managing and setting up your drawing. The file palatte offer time saving features such as batch operations while the seamless TurboCAD integration allows you to take maximum advantage of your TurboCAD software. Single Click Animation - A number of preset scenarios allow you to create an animation movie of your drawing with a single mouse click. For added flexibility, the library of preset animations is expandable, and can be used in conjunction with batch operations. 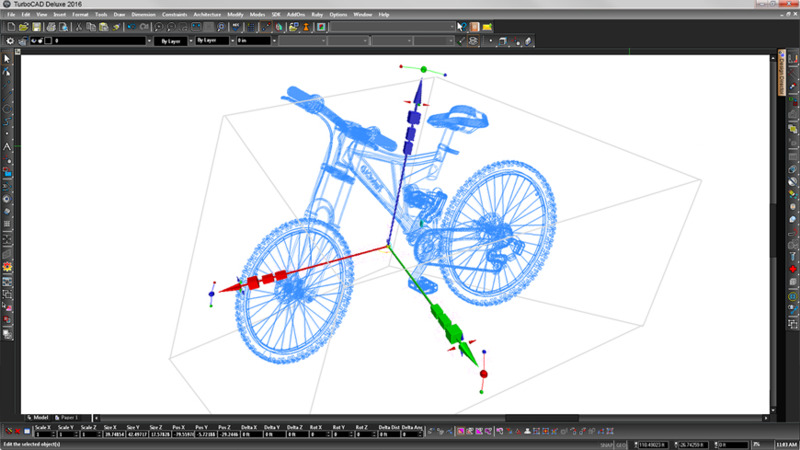 Graphical Key Frames Editor - AnimationLab allows you to automatically create scenarios using the Key Frames Editor. It calculates the commands for intermediate frames according to the defined key frames. This powerful editor even takes into account Constraint Manager Variables set in TurboCAD, as well as the TurboCAD Part Tree. Mix with Sound - You can assign a soundtrack for each actor. AnimationLab will calculate the sound scene, taking into account the distance to the actors, speed of their movement, and environment. Both mono- and stereo soundtracks can be calculated. Montage Center - Use this standalone AVI, and now MOV, processing utility to refine your AnimationLab creations. Splice animations together, compressed movies with defined quality and image size, preview movies and much more. Parameterization - AnimationLab supports variable command parameters. Define and control your object’s parameters through scenario commands in accordance with a mathematical rule, or data from a file. VBScript Support Enhancement - You can write your own commands using VBScript language (Microsoft Scripting Technologies) and save them in a drawing. Google Maps Plug-In for TurboCAD allows users to insert geo-referenced maps into TurboCAD Deluxe. Turn on or off street and building reference labels. Even choose angle view. You can easily geo-locate TurboCAD drawings and see map properties appear in the selection info palette. Easily Geo-Locate TurboCAD Drawings - If you don’t have the exact longitude and latitude of your site, click the map icon and zoom in to the desired location. As you adjust the map, the geo-location will update. Add 3D Terrain - With the Map’s Entity Type adjusted to Terrain, you will have the ability to adjust the smoothness of the terrain, change the isoline step, or add more isolines. Render your terrain, and with the Geo-Located Sun selected with shadows, you can see how shadows in the terrain affect your model. This simple utility plug-in will save you valuable time as you quickly create repeating patterns for use as brush patterns in your designs. Even add several existing patterns together for more complex designs. There are two fundamental ways of creating hatch patterns with the tool: By Symbol, and By Sample. By Symbol Mode - Select any drawing entities (Flexible text, Polylines, Lines, Arcs, Curves, Circles, etc) or their parts, using a selection fence, to create the pattern. The frequency and direction of reoccurrence of the pattern is easily modified using control points. By Sample Mode - Use the selection fence to select a sample, prepared in advance, and designed to create a pattern. The tool will automatically detect a valid repeating pattern. To be valid, the pattern must repeat both vertically and horizontally within the selection fence. The tool spots the pattern and creates the tiling hatch pattern. Using the tool you can also select existing patterns, adding several together, accumulating patterns and creating more complex designs. As you create new patterns, save them to the Brush Style Table and they will be available for repeated use. 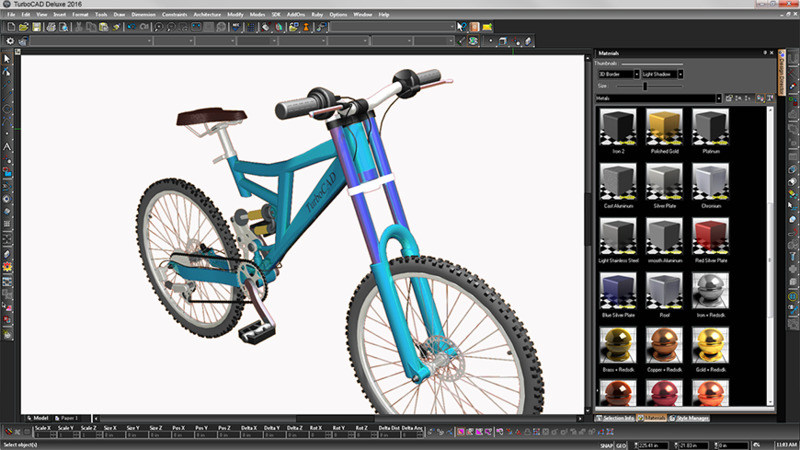 TurboCAD Deluxe is delivered in a 64-bit version to take full advantage of your hardware’s available computer memory to load, process, and render CAD files. A 32-bit version is also available if required by your hardware. Microsoft Windows 10, Windows 8* 64-bit, Windows 7 (64-bit), Vista (64-bit) - 4 GB RAM. Microsoft Windows 10, Windows 8*, Windows 7, Windows Vista** - 4GB RAM. *TurboCAD is designed for desktops or laptops that meet the indicated system requirements. Windows RT technology for use on tablets is not supported. ** 32-bit version of TurboCAD Deluxe will run on the Vista platform; however, this platforms is no longer being officially supported. The optional GPU-accelerated Redsdk render modes require a supported graphic processing unit (either a chip on the board, or on a video card). The latest video drivers are typically required. Newer boards with more power and VRAM generally provide greater performance.